Chicken Little was right. The sky is falling. Thousands of stars stripped from the nearby Sagittarius dwarf galaxy are streaming through our vicinity of the Milky Way galaxy, according to a new view of the local universe constructed by a team of astronomers from the University of Virginia and the University of Massachusetts. Using volumes of data from the Two-Micron All Sky Survey (2MASS), a major project to survey the sky in infrared light led by the University of Massachusetts, the astronomers are answering questions that have baffled scientists for decades and proving that our own Milky Way is consuming one of its neighbors in a dramatic display of ongoing galactic cannibalism. The study, to be published in the Dec. 20 issue of the Astrophysical Journal, is the first to map the full extent of the Sagittarius galaxy and show in visually vivid detail how its debris wraps around and passes through our Milky Way. Sagittarius is 10,000 times smaller in mass than the Milky Way, so it is getting stretched out, torn apart and gobbled up by the bigger Milky Way. "It's clear who's the bully in the interaction," said Steven Majewski, U.Va. professor of astronomy and lead author on the paper describing the results. In model images made to show the interaction in 3-D, available at http://www.astro.virginia.edu/~mfs4n/sgr/, the Milky Way appears as a flattened disk with spiral arms, while Sagittarius is visible as a long flourish of stars swirling first under and then over and onto the Milky Way disk. "If people had infrared-sensitive eyes, the entrails of Sagittarius would be a prominent fixture sweeping across our sky," Majewski said. "But at human, visual wavelengths, they become buried among countless intervening stars and obscuring dust. The great expanse of the Sagittarius system has been hidden from view." Not any more. By using infrared maps, the astronomers filtered away millions of foreground stars to focus on a type of star called an M giant. These large, infrared-bright stars are populous in the Sagittarius galaxy but uncommon in the outer Milky Way. The 2MASS infrared map of M giant stars analyzed by Majewski and collaborators is the first to give a complete view of our galaxy's meal of Sagittarius stars, now wrapping like a spaghetti noodle around the Milky Way. Prior to this work, astronomers had detected only a few scattered pieces of the disrupted Sagittarius dwarf. Even the existence of Sagittarius was unknown until the heart of this nearest satellite galaxy of the Milky Way was discovered by a British team of astronomers in 1994. "We sifted several thousand interesting stars from a catalog of half a billion," said co-author Michael Skrutskie, U.Va. professor of astronomy and principal investigator for the 2MASS project. "By tuning our maps of the sky to the 'right' kind of star, the Sagittarius system jumped into view." 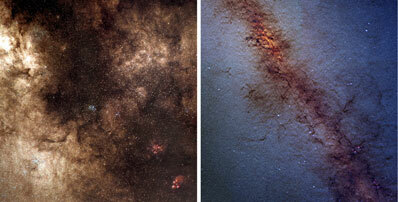 "This first full-sky map of Sagittarius shows its extensive interaction with the Milky Way," Majewski said. "Both stars and star clusters now in the outer parts of the Milky Way have been 'stolen' from Sagittarius as the gravitational forces of the Milky Way nibbled away at its dwarf companion. This one vivid example shows that the Milky Way grows by eating its smaller neighbors." "Astronomers used to view galaxy formation as an event that happened in the distant past," noted David Spergel, a professor of astrophysics at Princeton University after viewing the new finding. "These observations reinforce the idea that galaxy formation is not an event, but an ongoing process." The study's map of M giants depicts 2 billion years of Sagittarius stripping by the Milky Way, and suggests that Sagittarius has reached a critical phase in what had been a slow dance of death. "After slow, continuous gnawing by the Milky Way, Sagittarius has been whittled down to the point that it cannot hold itself together much longer," said 2MASS Science Team member and study co-author Martin Weinberg of the University of Massachusetts. "We are seeing Sagittarius at the very end of its life as an intact system." Does this mean we are at a unique moment in the life of our galaxy? Yes and no. "Whenever possible, astronomers appeal to the principle that we are not at a special time or place in the universe," Majewski said. "Because over the 14 billion-year history of the Milky Way it is unlikely that we would just happen to catch a brief event like the death of Sagittarius, we infer that such events must be common in the life of big spiral galaxies like our own. The Milky Way probably dined on a number of dwarf galaxy snacks in the past." On the other hand, Majewski and his colleagues have been surprised by the Earth's proximity to a portion of the Sagittarius debris. "For only a few percent of its 240 million-year orbit around the Milky Way galaxy does our Solar System pass through the path of Sagittarius debris," Majewski said. "Remarkably, stars from Sagittarius are now raining down onto our present position in the Milky Way. Stars from an alien galaxy are relatively near us. We have to re-think our assumptions about the Milky Way galaxy to account for this contamination." The new findings will help astronomers measure the total mass of the Milky Way and Sagittarius galaxies, and probe the quantity and distribution of the invisible dark matter in these systems. "The shape of the Sagittarius debris trail shows us that the Milky Way's unseen dark matter is in a spherical distribution, a result that is quite unexpected," Weinberg said. "The observations provide new insights into the nature of the mysterious dark matter," said Princeton's Spergel. "Either our galaxy is unusual or the dark matter has richer properties than postulated by conventional models." 2MASS was a joint project of the University of Massachusetts and the Infrared Processing and Analysis Center/California Institute of Technology. The National Aeronautics and Space Administration, and the National Science Foundation funded the project. Additional funding for the Sagittarius study with 2MASS came from the David and Lucile Packard Foundation and the Research Corporation. See inside the Apollo Command and Service Modules in detail like never before through color computer generated drawings. The cancelled Soviet space shuttle Buran is commemorated in this special cloth patch available from our store. Relive the last manned mission to the moon with this six-disc DVD featuring more than 25 hours of footage. Now shipping from the Astronomy Now Store.